This flow adhesion assay provides a simple, high impact model of T cell-epithelial cell interactions. A syringe pump is used to generate shear stress, and confocal microscopy captures images for quantification. The goal of these studies is to effectively quantify T cell adhesion using flow conditions. Strazza, M., Azoulay-Alfaguter, I., Peled, M., Mor, A. Assay of Adhesion Under Shear Stress for the Study of T Lymphocyte-Adhesion Molecule Interactions. J. Vis. Exp. (112), e54203, doi:10.3791/54203 (2016). Overall, T cell adhesion is a critical component of function, contributing to the distinct processes of cellular recruitment to sites of inflammation and interaction with antigen presenting cells (APC) in the formation of immunological synapses. These two contexts of T cell adhesion differ in that T cell-APC interactions can be considered static, while T cell-blood vessel interactions are challenged by the shear stress generated by circulation itself. T cell-APC interactions are classified as static in that the two cellular partners are static relative to each other. Usually, this interaction occurs within the lymph nodes. As a T cell interacts with the blood vessel wall, the cells arrest and must resist the generated shear stress.1,2 These differences highlight the need to better understand static adhesion and adhesion under flow conditions as two distinct regulatory processes. The regulation of T cell adhesion can be most succinctly described as controlling the affinity state of integrin molecules expressed on the cell surface, and thereby regulating the interaction of integrins with the adhesion molecule ligands expressed on the surface of the interacting cell. Our current understanding of the regulation of integrin affinity states comes from often simplistic in vitro model systems. The assay of adhesion using flow conditions described here allows for the visualization and accurate quantification of T cell-epithelial cell interactions in real time following a stimulus. An adhesion under flow assay can be applied to studies of adhesion signaling within T cells following treatment with inhibitory or stimulatory substances. Additionally, this assay can be expanded beyond T cell signaling to any adhesive leukocyte population and any integrin-adhesion molecule pair. T lymphocyte adhesion mediates a number of distinct processes in a healthy immune system,3 playing critical roles in T cell trafficking and antigen presentation. Whether during immune surveillance or an active immune response these two broad roles for adhesion are critical.4 The physiological signaling events of T cell-endothelial cell interactions are distinct from T cell-antigen presenting cell (APC) interactions, and therefore require distinct methods of study to best understand the signaling cascades involved. The firm adhesion of a T cell to a blood vessel wall during lymphocyte extravasation requires rapid and dynamic integrin activation. The tight interaction between an active state integrin and adhesion molecules along the endothelium leads to adhesion resistant to the flow of blood, allowing T cells to crawl along the surface in search of an area permissive to cell passage.5 The crawling of a T cell bi-directionally along a blood vessel wall is reliant upon polarized adhesion, with a distinct adhesive front end of the T cell.6 Most importantly, firm adhesion and transmigration require resistance to the shear force generated by circulating blood flow. When designing experiments to study lymphocyte adhesion, attention should be paid to the specific stimulus of interest. While integrin activation is a common and critical component of all forms of T cell adhesion, the cascades of activation are likely to be unique downstream of individual receptors and co-receptors. Likewise, integrin and adhesion molecule pairs function in specialized microenvironments and on specific subpopulations. In this way, these pairs may be regulated quite differently. The model presented here is ideal for the study of signaling cascades leading to integrin activation taking place under shear stress conditions.7 These interactions cannot be adequately understood in a static adhesion system due to the impact these forces have been shown to have directly on T cell behavior.8 Though presented here with T cells and CHO (Chinese Hamster Ovary) cells engineered to express human ICAM-1 (CHO-ICAM cells) the system can easily be modified to study different leukocyte populations or adhesion molecules. This assay provides a method to quantify T cell adhesiveness and integrin activation using shear stress, providing a model for the firm adhesion stage of leukocyte extravasation. Through the use of CHO-ICAM cells the affinity of LFA-1 for its ligand in live cells can be examined in real time in response to various stimuli of interest. This technique requires easily obtained, commercially available micro-flow chambers in combination with a syringe pump, greatly simplifying the equipment necessary to model blood flow and shear stress as compared to other models.9 Another major advantage of this assay is that specific signaling cascades and the resulting activation state of individual integrins can be cleanly studied through the use of engineered CHO cells expressing human adhesion molecules of interest. Additionally, the combination of quantitative data with live cell imaging is a significant advantage of this method. Overall, while a number of assays of static T cell adhesion have been described that nicely model T cell-APC interactions, these models are insufficient in capturing the dynamic process of T cell-epithelial adhesion. For this reason, when choosing an adhesion assay the stimulus in question must be considered. Note: The goal of this step is to plate the CHO-ICAM cells in the flow chambers for growth overnight with the goal of generating a confluent monolayer. Maintain CHO-ICAM cells in 10 cm tissue-culture treated culture dishes in 10 ml RPMI media supplemented with 10% fetal bovine serum (FBS) and 1% penicillin/streptomycin (CHO-ICAM complete culture media) at 37 °C with 5% CO2. To collect cells, add 1 ml 0.5% trypsin-EDTA and incubate at room temperature for 1 min with gentle shaking. Neutralize the trypsin with 4 ml of media. 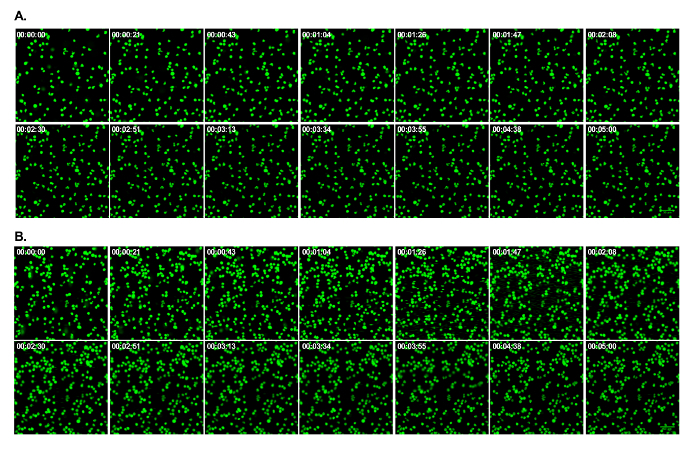 Count the CHO-ICAM cells using a hemacytometer and calculate 0.75 x 105 cells per chamber. Note: In this experiment: 2.25 x 105 cells will be needed to seed 3 chambers. Centrifuge 0.75 x 105 CHO-ICAM cells per chamber for 5 min at 500 x g, room temperature and resuspend the cell pellet in 30 µl per chamber of CHO-ICAM complete culture media. Note: In this experiment 90 µl will be needed to seed 3 chambers. Slowly add the cells into one reservoir of the flow chamber. Allow the cells to settle for 5 min in the 37 °C incubator with 5% CO2. Add 200 µl of complete culture media across the two reservoirs of each chamber. Alternate additions between the two to avoid movement of the cells as the system equilibrates. Incubate the cells overnight inside a 37 °C incubator with 5% CO2. Note: This assay can be done with primary human T cells or a T cell line. A protocol on T cell isolation from blood has been described previously.10 If using primary human T cells use freshly isolated cells for best results. If using a T cell line, follow the culture protocol specified by the source of the cells. In order to detect the cells on a fluorescent microscope the T cells are labeled with carboxy fluorescein succinimidyl ester (CFSE). Count the T cells using a hemacytometer and calculate 2 x 106 cells per chamber. Note: In this experiment, 6 x 106 cells will be needed for 3 chambers. Centrifuge 2 x 106 T cells per chamber for 5 min at 500 x g, room temperature and resuspend the cells in 1 ml of phosphate buffered saline (PBS) containing 1% glucose or 2% FBS. Spin at 500 x g for 5 min, RT. Resuspend cell pellet with 240 µl per condition (See Section 4 "Note") of RPMI media lacking serum. In this experiment, resuspend the cell pellet in 720 µl of plain RPMI. Divide the cells into empty 1.5 ml tubes labeled for each chamber, 240 µl per tube. Keep cells in a 37 °C heat block until use. Warm the microscope live imaging chamber to 37 °C. Fill a 500 ml glass bottle with water and make 2 holes into the lid. Label the holes "in" and "out." This will act as a heating water bath for the input media. Run the input hosing through the holes in the lid and into the water bath. Ensure that the side of the hosing that connects to the syringe comes through the "in" hole and the side that will connect to the input reservoir comes through the "out" hole. Flush the input hosing with 60 ml of water to remove any air from the system. Prime the input hosing with RPMI media lacking serum warmed to 37 °C. Fill a 60 ml syringe and push through the media until the hosing is completely primed and lacking any air bubbles. Note: Depending on the length of tubing used the volume required to prime will vary. Calculate the volume of media needed for the experiment by multiplying the rate of flow (here 0.3 ml/min) by the number of minutes (5 min) by the number of chambers in the experiment (here 3); in this experiment, use 4.5 ml media. Note: We recommend having 5 ml extra volume (here totaling 9.5 ml) remaining in the syringe after priming. Place the entire input setup into the live imaging enclosure of the microscope to maintain 37 °C. Run the hosing and syringe out of the enclosure and load the syringe into the syringe pump. Make a hole in the lid of a 250 ml bottle to use as output waste. Run the output tubing through the hole and into the bottle. Loosely secure the lid, not closing all the way. Place the output setup into the live imaging enclosure of the microscope. Calculate the flow rate (ml/min) necessary to generate the desired shear stress (dyn/cm2). Shear stress varies in different vascular compartments, therefore take into account the overall model including cell types to be studied and treatments when deciding on a shear stress level. Note: These experiments are conducted at 0.4 dyn/cm2 to closely mimic a small vein setting. Take the chamber dimensions into account when calculating shear stress. Use the following formula (provided by the manufacturer11) for the flow chambers used here (See Table of Materials): T = η * 176.1 * ø where T = shear stress, η = dynamical viscosity, ø = flow rate. Note: The dynamical viscosity of RPMI media at 37 °C is 0.007. Note: In order to initiate adhesion, T cells must be stimulated. In the following experiment the cells will either remain unstimulated or are stimulated with SDF-1α12 or phorbol myristate acetate (PMA; positive control)13. For proper presentation of chemokine to T cell, CHO-ICAM cells are preincubated with SDF-1α (followed by serial washes), allowing for presentation on the cell surface. PMA is a phorbol ester that is structurally similar to the second messenger diacyl glycerol (DAG); here it is used as a positive control. T cells are directly treated with PMA prior to loading into the flow chamber. Place the flow chamber slide on the microscope and set the focal plane on the CHO-ICAM monolayer using the 20X objective. For the unstimulated condition (chamber 1), keep one tube/flow chamber untreated, to serve as negative control for stimulation. For PMA stimulation (chamber 2), stimulate one tube of T cells with PMA (10 ng/ml) to serve as positive control; treat immediately before loading into flow chamber. For SDF-1α stimulation, (chamber 3), stimulate the third flow chamber with SDF-1α (100 ng/ml) by removing 70 µl at a time 3 times from the upper reservoir (output reservoir) and then adding 70 µl of SDF-1α (100 ng/ml) into the lower reservoir (input reservoir). Incubate for 5 min. Remove and discard 70 µl at a time 3 times from the output reservoir of one chamber. Add 70 µl of pre-treated (as applicable) T cell suspension into the input reservoir 3 times. Wait 5 min to allow the cells to move from the inlet of the chamber ("In"), and to reach the proximal outlet ("Out") of the chamber. During this time, image 5 fields for CFSE-stained T cells. Choose fields that are dispersed throughout the center of the chamber (Figure 1). Use the following excitation/emission conditions: excitation laser wavelength: 488 nm; emission collection filter: 500 - 540 nm. These images will serve as the pre-flow cell counts. Attach the input and output tubing simultaneously to the flow chamber reservoirs. Note: Attaching the tubing simultaneously is critical so as to not introduce air bubbles into the chamber and maintaining overall equilibrium within the chamber. Begin flow at 0.3 ml/min (0.4 dyn/cm2) while visualizing the CFSE-stained T cells. As flow begins, especially with the first chamber, there is often a lag between initiating flow and observing T cell rolling, therefore begin timing 5 min at the onset of T cell movement. Terminate flow after 5 min, and image 5 fields in the CFSE channel. Choose fields randomly dispersed throughout the center of the flow chamber (Figure 1). 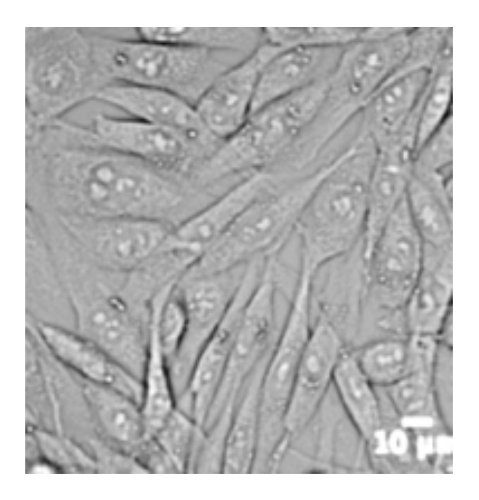 These images will serve as the post-flow cell counts. Note: Determination of the number of the cells in the acquired images is done objectively with automated software. For our studies we used the software Volocity (Version 6.2.1), but other software such as ImageJ (Version 1.48V) are also applicable. Calculate the percentage of adherent cells using the following formula: Percentage of adherent cells = (post-flow average cell count)/(pre-flow average cell count) x 100%. Representative results are shown from the flow adhesion assay using Jurkat and primary human CD3+ T cells, as indicated, stimulated with SDF-1α. The negative controls in all shown experiments are unstimulated cells. A threshold basal percent adhesion of unstimulated cells is between 5 - 10%; base adhesion notably above this range indicates a problematic experiment and suggests the start population of T cells were nonspecifically pre-activated in preparation. Fold increase in number of adherent cells post-flow in each condition over that of unstimulated cells can be calculated in addition to the calculation of percent adhesion. Data representing these two calculation methods is included here. Figure 2A shows representative images of fields within the flow chamber for each condition pre- and post-flow. Prior to the experiment, Jurkat (shown in Figure 2A) or primary human CD3+ T cells are purified, counted, and labeled with CFSE. For each experimental condition 2 x 106 cells were labeled. Unstimulated T cells were loaded into flow chambers containing CHO-ICAM cells in the presence or absence of SDF-1α. The T cells were allowed to move and accumulate in the chamber for 5 min, and during this time images were captured to determine the pre-flow counts. A comparable number of cells pre-flow among the different stimulations is essential to insure uniform experimental conditions. Following 5 min of continuous shear stress generated by flow, images were again captured to determine post-flow counts. It is evident through these representative images that SDF-1α increases the number of T cells able to adhere to the CHO-ICAM cells under shear stress. Figure 2B shows the fold change in T cell adhesion as calculated based on the number of Jurkat T cells pre- and post-flow either unstimulated or in the presence of SDF-1α. For every condition the average cell counts of 5 fields pre-flow and 5 fields post-flow were determined, and a comparison of SDF-1α stimulation to unstimulated is used to calculate fold change in T cell adhesion. As shown here, SDF-1α induces a near 2-fold increase in adhesion compared to unstimulated. Figure 2C demonstrates an alternative method of data calculation. Here the percent adhesion of primary human CD3+ T cells in the presence or absence of SDF-1α is determined by first determining the average pre- and post-flow T cell counts, then dividing the post-flow average by the pre-flow average and multiplying by 100. Through this calculation the entire pre-flow population represents 100% adhesion. As shown here, 15% of unstimulated T cells adhere under shear stress as compared to 50% of T cells stimulated with SDF-1α. Figure 1. It is important to analyze only areas exposed to homogenous flow. Schematic representation of the flow chambers used with indication of where fields should be imaged. As per information provided by the chamber manufacturers, the pre-set flow rate is only achieved through the center of the chambers, indicated by orange in this schematic. Closer to the borders of the chamber the flow rate decreases and should not be included in experimental imaging or analysis. Please click here to view a larger version of this figure. Figure 2. SDF-1α induces T cell adhesion to ICAM-1 under shear stress. A. Jurkat T cells were labeled with CFSE at a concentration of 5 µM. Next, the cells were loaded into the flow chambers that were pretreated with SDF-1α (100 ng/ml) or unstimulated and set up on the confocal microscope and allowed to move and accumulate in the chamber for 5 min. Alternatively, Jurkat T cells were pretreated with PMA (10 ng/ml) prior to addition to the flow chambers. Throughout those 5 min pre-flow images were captured. Flow was then initiated at 0.4 dyn/cm2 to create shear stress for 5 min. Upon completion, post-flow images were captured. Representative images of Jurkat T cells are shown, scale bar 50 µm. B. 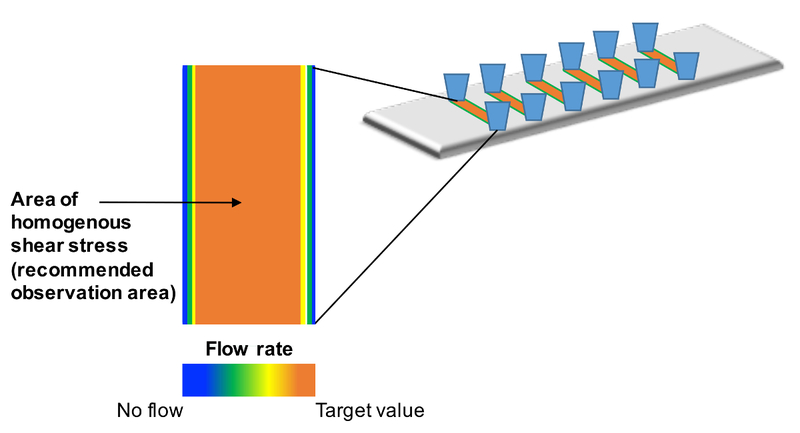 Fold change in adhesion of Jurkat T cells was calculated by first determining the average pre- and post-flow cell counts for each condition and dividing the average post-flow count by the average pre-flow count individually for each condition. This adhesion quotient for each stimulation condition, here SDF-1α or PMA, is then divided by the unstimulated adhesion quotient to determine the fold change in adhesion. Bars represent average of 3 experiments ± SEM. C. Percent adhesion of primary human CD3+ T cells was calculated by first determining the average pre- and post-flow cell counts for each condition. For each condition, the average post-flow count is divided by the average pre-flow count and multiplied by 100. The resulting percent adhesion is based on the pre-flow cell count being 100% adhesion. Bars represent average of 5 experiments ± SEM. Please click here to view a larger version of this figure. Figure 3. T Cells first accumulate then flow over the CHO-ICAM monolayer. Jurkat T cells were labeled with CFSE at a concentration of 5 µM. Next, the cells were loaded into the flow chambers that were pretreated with SDF-1α (100 ng/ml) and set up on the confocal microscope and allowed to move and accumulate in the chamber for 5 min. Throughout these 5 min images were captured as a time-lapse series; still frames (A). Flow was then initiated at 0.4 dyn/cm2 to create shear stress for 5 min. Throughout these 5 min images were captured as a time-lapse series; still frames (B). The direction of flow in these images is from bottom to top, and the focal plane is set at the CHO-ICAM monolayer. T cells can be categorized into 3 groups: (1) T cells rolling along the monolayer at the flow rate are visualized as short, horizontal lines moving from bottom to top across the field since they are moving rapidly while being imaged. (2) T cells crawling along the monolayer. These cells are firmly adhered based on the resistance to flow, and are crawling likely in search of an area permissive to cellular passage, which is not observed in this model. (3) T cells that firmly adhere to the monolayer, are resistant to flow, but are immobile. These cells are not actively rolling or crawling along the monolayer. A more sophisticated analysis can be done, based on the goals of the study, through the use of an ImageJ script designed to dissect these cell populations for further quantification or characterization. Scale bars 50 µm. Please click here to view a larger version of this figure. Figure 4. CHO-ICAM cells must form a confluent monolayer. Representative image of a confluent CHO-ICAM monolayer within a flow chamber. Scale bar 10 µm. Please click here to view a larger version of this figure. In order to properly analyze T cell adhesion, the stimulant to be included in the study must be considered when choosing an in vitro method. While there are several assays to study signals leading to LFA-1 activation and ICAM-1 binding all methods are not interchangeable. A static adhesion assay10 is best suited to study T cell-APC interactions; alternatively, the shear stress method detailed here is ideal to model T cell-epithelial cell interactions. In vivo, as chemokines are presented along the endothelium, rolling T cells must respond by firmly adhering and resisting the shear stress of blood flow14,15. For this reason, the study of chemokine signaling is best suited to be studied in an assay that incorporates shear stress. The primary advantage of this adhesion using flow conditions is its simplicity in modeling the interactions between T cells and integrins. This assay quite uniquely combines function and mechanistic studies by modeling an environment for the study of one integrin-adhesion molecule pair. Another strength of this method is its adaptability; this method can be used to quantify adhesion of any leukocyte to any adhesion molecule. This method can be used to screen the effect of multiple drugs or genetic manipulations expected to alter T cell recruitment and extravasation through altered integrin activation. As with any in vitro method, there are some limitations of this assay. This model uses engineered CHO cells rather than stimulated primary endothelial cells as other models have used.16 While this gives us the ability to understand the signaling events influencing the activation state of a single integrin, this can also be considered a weakness of the model. As there are no selectins expressed by the CHO cells, the assay is done in two steps. During the first step (the accumulation phase), the T cells are injected into the input reservoir at one side of the chamber and travel to the other side by minimal pressure and capillary forces. The behavior of the T cells throughout these 5 min can be observed in Figure 3A. After 5 min, and during the second step (the flow phase) the flow rate is increased and the cells will start to roll and adhere. It is important to note that not all T cells injected into the input reservoir move across the chamber during the accumulation phase, and these cells do roll along the monolayer as flow is increased (Figure 3B). In this way, the rolling stage of extravasation is artificially enhanced, but not eliminated, in this model. Since the maximum number of adherent cells is an expression of the number of input cells that enter into the chamber there is the potential for raw number variability among experiments. While the preflow images do not fully represent the 100% maximum T cell population because they do not take into account the input reservoir, it is an important control to include in calculations especially when two different cell types counted individually are to be compared. Additionally, it is not recommended that primary blast lymphocytes be used in a single variable adhesion analysis. That is to say, pre-stimulation of the T cells through T-cell receptors (TCR) and/or co-receptors may confound the effect of the treatment of interest on adhesion. These variables should be considered during experimental design. Likewise, functional studies with previously frozen PBMCs often yield confounding results, and for this reason cell lines or freshly isolated primary PBMCs work best with this assay. Understanding the normal base level of unstimulated adhesion for the PBMC included in the study is critical in identifying a cell population that has been nonspecifically pre-activated leading to confounding results. To replicate this assay with accuracy, it is essential that some steps in the protocol, including the settling and flow incubation times, be precise and uniform among all conditions. In this same light, CHO-ICAM cells must be uniformly confluent throughout all the flow chambers (Figure 4) and the T cell counts must also be precise.17 Even small differences in these factors may impact accuracy of cell counts in the end. A future application of this assay is the development of a series of cell lines individually expressing selectins and adhesion molecules to expand the impact of this method to other signaling cascades. The Rheumatology Research Foundation and the Hirschil Trust supported this work. Alon, R., Ley, K. Cells on the run: shear-regulated integrin activation in leukocyte rolling and arrest on endothelial cells. Curr Opin Cell Biol. 20, (5), 525-532 (2008). Ley, K., Laudanna, C., Cybulsky, M. I., Nourshargh, S. Getting to the site of inflammation: the leukocyte adhesion cascade updated. Nat Rev Immunol. 7, (9), 678-689 (2007). Dustin, M. L., Bivona, T. G., Philips, M. R. Membranes as messengers in T cell adhesion signaling. Nat Immunol. 5, (4), 363-372 (2004). Mor, A., Dustin, M. L., Philips, M. R. Small GTPases and LFA-1 reciprocally modulate adhesion and signaling. Immunol Rev. 218, 114-125 (2007). Rose, D. M., Alon, R., Ginsberg, M. H. Integrin modulation and signaling in leukocyte adhesion and migration. Immunol Rev. 218, 126-134 (2007). Alon, R., Feigelson, S. W. Chemokine-triggered leukocyte arrest: force-regulated bi-directional integrin activation in quantal adhesive contacts. Curr Opin Cell Biol. 24, (5), 670-676 (2012). Su, W., et al. Rap1 and its effector RIAM are required for lymphocyte trafficking. Blood. 126, (25), 2695-2703 (2015). Judokusumo, E., Tabdanov, E., Kumari, S., Dustin, M. L., Kam, L. C. Mechanosensing in T lymphocyte activation. Biophys J. 102, (2), L5-L7 (2012). Zeltzer, E., et al. Diminished adhesion of CD4+ T cells from dialysis patients to extracellular matrix and its components fibronectin and laminin. Nephrol Dial Transplant. 12, (12), 2618-2622 (1997). Strazza, M., Azoulay-Alfaguter, I., Pedoeem, A., Mor, A. Static adhesion assay for the study of integrin activation in T lymphocytes. J Vis Exp. (88), (2014). Ibidi GmbH. Shear stress and shear rates for ibidi μ-Slides - based on numerical calculations. Application Note 11. Available from: http://ibidi.com/fileadmin/support/application_notes/AN11_Shear_stress.pdf (2014). van Gijsel-Bonnello, M., et al. Pantethine Alters Lipid Composition and Cholesterol Content of Membrane Rafts, With Down-Regulation of CXCL12-Induced T Cell Migration. J Cell Physiol. 230, (10), 2415-2425 (2015). Tozeren, A., et al. Micromanipulation of adhesion of phorbol 12-myristate-13-acetate-stimulated T lymphocytes to planar membranes containing intercellular adhesion molecule-1. Biophys J. 63, (1), 247-258 (1992). Mortier, A., Van Damme, J., Proost, P. Overview of the mechanisms regulating chemokine activity and availability. Immunol Lett. 145, (1-2), 2-9 (2012). Rot, A. In situ binding assay for studying chemokine interactions with endothelial cells. J Immunol Methods. 273, (1-2), 63-71 (2003). Yang, L., et al. ICAM-1 regulates neutrophil adhesion and transcellular migration of TNF-alpha-activated vascular endothelium under flow. Blood. 106, (2), 584-592 (2005). Long, E. O. ICAM-1: getting a grip on leukocyte adhesion. J Immunol. 186, (9), 5021-5023 (2011).